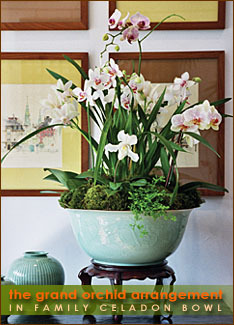 The grand white orchid arrangement is a reminder of a time when only a few wealthy and discerning elite were able to produce such grandiose luxuries for themselves: beautifully marked white orchids of many different species from all over the world are placed together to create this stunning medley. Available now in our San Francisco Home and Orchid Gallery. Click image for more options.